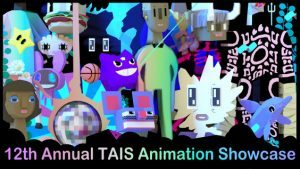 the TWELFTH ANNUAL TAIS ANIMATION SHOWCASE – Bringing the Best Independent Canadian and International Animation to Toronto! On Saturday, July 28th, the Toronto Animated Image Society (TAIS) is thrilled to present a summer night of animated dreams: two 45 minute programmes of short animated films, the results of the 2018 Anijam competition, and a new commissioned work by Amanda Low. Featuring 18 short animated films, the finalists in this year’s programme are diverse in style and content. Including themes of self-love and aspiration, loss and struggle, narratives of deception, community and connection, and playful experimental works exploring form and sound, this year’s programme proudly features films from 6 different countries: Canada, USA, Costa Rica, UK, China, and Taiwan. Awards will be given – as selected by the audience, and by a guest jury of animation artists: Amy Lockhart, Paloma Dawkins, and Rory Waudby-Tolley. The audience will select an ‘Audience Choice – Short Film’ and ‘Audience Choice – Best Anijam’. The jury will award a ‘Grand Prize – Best of the Showcase’ award, and a ‘Jury’s Best Anijam’ award. Full bios for the 2018 Jury are available HERE . Also featured is TAIS’ FAN FICTION Anjiam competition. With 12 entries this year, these 10-second animations are mash-up masterpieces, with creative never-before-seen combos that hint at unique universes filled with familiar characters. For the second year in a row, the Showcase Jury’s pick for Best Anijam will be awarded a cash prize and in-kind studio use toward production of a short animated project for presentation at TAIS Showcase in 2019. The audience will also decide a Best Anijam Audience Award on the night of the screening. Featuring Anijams by Chris Jack (Toronto), Kathryn Wehrle (Toronto), Mawrgan Shaw (Toronto), Tommy Truong (Vaughan), Lynn Dana Wilton (Unionville), Miguel Bettencourt (York), Paul Scott (Toronto), Tami Poliwoda (Thornhill), Lucas Gilberson (Calgary), Vivian Saad (São Paulo, Brazil), Mike Robbyns (Toronto), Alvaro Giraldo (Lima, Perú). See you on July 28th! For the 12th Annual TAIS Animation Showcase promotional campaign, artist Jeron Braxton was commissioned to produce this eye-popping artwork, created in response to our Anijam theme FAN FICTION. $10 advance / $12 door / $8 door for TAIS members. This entry was posted on Thursday, July 5th, 2018 at 9:44 am	and is filed under News. You can follow any responses to this entry through the RSS 2.0 feed.